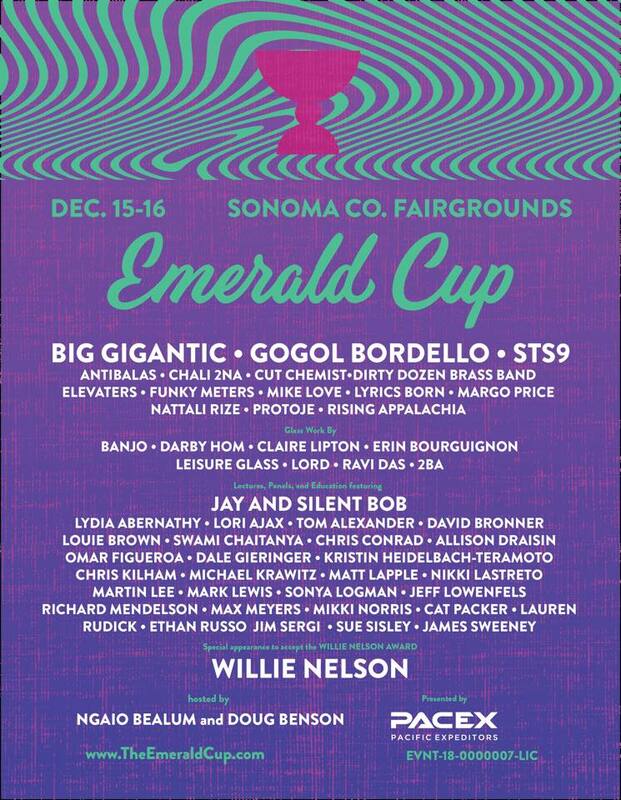 SANTA ROSA, CALIFORNIA - December 4, 2018 - The team behind Northern Nights Music Festival (“NNMF”) returns to Santa Rosa in collaboration and support of the 15th annual The Emerald Cup, on December 15th & 16th, for the largest, most respected, organic, outdoor, cannabis competition in the world. Rather than your typical mid-grade parking lot cookie cutter weed event, “The Cup” brings an eclectic mix of influencers that include Willie Nelson, Big Gigantic, Jay & Silent Bob, Gogol Bordello, David Bronner, Protoje, and STS9 together with the California’s top tier legal cannabis producers and brands, with a extra emphasis on the California sungrown, regenerative and organic experience. For a second year in a row, the Cup has once again given NNMF the nod to produce its own stage, officially and fittingly dubbed the Redwood Stage, which will feature Dirtybird member & NN18 show stopper Ardalan, hip hop artist/indigenous environmental activist/youth director of Earth Guardians Xiuhtezcatl, internationally acclaimed tropical bass heavyweight Captain Planet, and UK artist Breach coming from across the pond, to name a few. More than just a music festival, Northern Nights prides itself as a staple in the Northern California culture, where the “city meets the country”. This is no better highlighted than in the infamous Northern Nights Tree Lounge, which showcases the best and the brightest of The Emerald Triangle’s farmers, manufacturers, and brands with distributors, retailers and entrepreneurs from around the Golden State. The Tree Lounge at this years Emerald Cup, located in the cannabis consumption area, will include HF Raw & Uncut, HumFarms, Wildseed, Focus Concentrates, Wonderland Nursery, Node Labs, Heshies, Cali's Finest and will be hosted by the One Log House and powered by Meadow. This will be the last and final Tree Lounge production before the recently passed assembly bill AB2020 goes into effect, which will allow festivals held on private property, like Northern Nights, to have on site cannabis sales for the very first time. About Northern Nights Music Festival: A celebration of music, art, cannabis, food, and Northern California culture, the annual Northern Nights Music Festival (NNMF) takes place every third weekend in July. NNMF has created it’s home along the South Fork Eel River at Cook’s Valley Campground, 3.5 hours north of San Francisco at the intersection of Mendocino and Humboldt counties. Since the inception, NNMF has cemented it’s place among the ranks of the many acclaimed music festivals that have converged along the Eel River over the past 30 years, from Jerry Garcia’s Electric on the Eel to Reggae on the River.